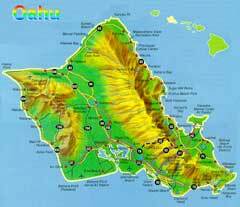 The island of Oahu is shaped somewhat like a 5 pointed star, with two main land masses formed by the Wainae Volcano along the leeward coast, and the Ko'olau mountain range that forms the main land mass. From the air it is easy to identify the large bay of Pearl Harbor, and the disctinct calderas and volcano crater landmarks of Hanauma Bay, Diamond Head, and Punch Bowl Crater and transform your Oahu bound travels into a wonderful flight-seeing tour. The more common landing pattern into the Honolulu International Airport (HNL) is with trade winds. Your plane will traverse across O‘ahu diagonally from Kāne‘ohe/Kailua and head towards the South shore where the city sprawl of Honolulu laps up major valley walls and ridgelines and spills down towards tall buildings sprouting along Waikiki shoreline. The plane will follow a trajectory course towards Kapolei about 1/2 mile from land and before turning around for the final approach. Another possible scenario is that your flight plan will skirt the Northern part of the island, keep your eye peeled for the North Shore communities of Laie and Kahuku, look for world famous Waimea Bay and rugged Kaena Point before tracking along the South shore past Ko‘olina and make the final line-up for the Honolulu Airport. During this final approach that you'll have stunning views of the Ko‘olau Mountain range, Pearl Harbor, where you may be able to pick out the Arizona Memorial if you are sitting on the LEFT side of the plane . If there are Kona winds, you'll make your landing approach coming directly past Diamond Head, where you can sometimes see right into the crater itself, even at the required 1 mile from shoreline, then following Waikīkī and approaching from the south, before descending right into HNL. So, how do you know when you buy your on-line ticket which way the wind will blow? There's of course no way of knowing for sure which landing pattern is being used at HNL unless you check the weather report for Honolulu on the day of your travel (even then, there's no guarantee). but just remember that Kona wind landings are common during the winter months. and rare during the summer. A rule of thumb: Southerly/Kona Winds head for the RIGHT side of the plane Northerly/Trade Winds: pick a seat on the LEFT side of the plane. Oops? Did you get stuck on the isle, that's OK too, just remember your desination is Hawaii, and sit back and enjoy the landing, knowing all the fun and beauty of the islands is waiting for you to explore up close and personal!